SIESTA KEY — It was an unusually cold Thursday on Jan. 7, 1921, the kind of day that made one’s extremities go numb. That morning Bert Lutzier and his son, Merle, discovered something far more chilling than the temperature—a man, soaking in a pool of blood, was lying in the middle of Beach Road. Bert and Merle, construction workers tasked with shoveling and hauling shell to developments along Sarasota Key—present-day Siesta Key—came across the sinister scene at the start of their workday. A closer inspection revealed the man had a pulse although he was unresponsive and gurgling blood. His face was so badly bludgeoned he was unidentifiable. Immediately, they put him in the back of their truck and raced to Dr. Joseph Haldon’s home in Sarasota. Upon diagnosing the man’s critical condition, (he suffered from a deep laceration above the right eye), Haldon ordered him taken to the closest hospital in Bradenton. While making the journey south, the caretakers noticed the injured man wore several pieces of gold jewelry. On one hand, a ring with the initials “H.H.” gave away his identity. The caretakers decided he was Harry Higel, one of the most prominent developers in Sarasota and a former city mayor who served during Sarasota’s 1913 incorporation. Considered a new-age politician, Higel pushed for Sarasota’s development. When no bridge connected Sarasota Key to the mainland, Higel would sail potential land buyers across the bay to show them properties. He built the prestigious Higelhurst Hotel, and had his hands in other numerous land deals and developments on the key. But Higel never saw Sarasota Key reach its potential. That cold January day, he died before ever reaching the hospital. He was 53. While police were looking into a confrontation Harry had with an African-American construction worker a few days prior, members of the public were pointing fingers in another direction. A mob of local residents formed and kidnapped Sarasota Sun editor Rube Allyn, who had a long-standing beef with the businessman. The short-tempered Allyn had a reputation for behaving erratically. The mob hung a rope around his neck and was about to string him up when police intervened and transported him to jail in Bradenton to ensure his safety. 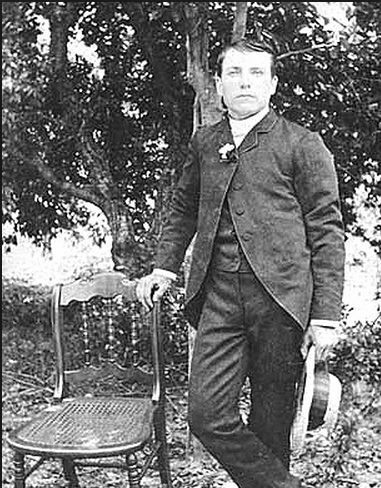 In the 1910s, Higel quarreled with Allyn over an unpaid debt after he’d lent Allyn money for a home near his prized Higelhurst Hotel on the north end of Sarasota Key. Allyn not only lived at the location, he also printed the Sarasota Sun inside a dockside office. Aside from the debt, Higel cringed every day when a donkey-drawn cart carrying Allyn’s disabled son passed the property, and disapproved of Allyn allowing his chickens to run amok instead of keeping them cooped up. In 1917, the Higelhurst Hotel mysteriously burned down one month before the bridge to Sarasota Key was completed. Higel suffered a major financial loss and had to rebuild. No one knew whom or what was responsible for the fire, but many folks believed it was Allyn, mostly because of his close proximity to the property and his assertiveness toward Higel. During the 1916 local elections, Allyn is said to have criticized Higel’s character in his newspaper. Regardless of the relationship the two men had, there was not enough evidence to convict Allyn of Higel’s murder. On March 10, 1921, a Grand Jury acquitted him of all charges, taking only 10 minutes to deliberate. They found the evidence to be circumstantial. While Allyn’s jail time meant the end of his career at the Sarasota Sun, he was still working as an editor of Florida Fisherman, a publication put out by the St. Petersburg Times. The Times stood by Allyn, considering that he had spent much of his time surrounding the murder in St. Petersburg perfecting the start-up magazine. Upon his arrest, his wife took over management of the Florida Fisherman to ensure it would print on time. Allyn moved away from Sarasota, finally settling in Ruskin. There is a coral reef named after him in Pinellas County. As for Higel’s murder, it remains unsolved. Although authorities suspected the African-American laborer because he had been shoveling for Higel the day before and a shovel could have caused the injuries, the charge lacked evidence. A handsome reward was offered to anyone with evidence, but nothing ever came of it. Instead, the murder of Higel remains cloaked in secrecy and always will be one of Southwest Florida’s greatest mysteries. SARASOTA — It’s almost impossible to mention Sarasota without naming its greatest advocate John Ringling. The circus tycoon is synonymous with the city’s development investing heavily in property and helping to shape the area, as we know it. However, Ringling had a female counterpart who is rarely mentioned by residents. While the name Bertha Palmer might not ring a bell, you probably have driven down a road that bears her maiden name Honore. Both Palmer and Ringling arrived in Sarasota in the 1910s during the height of the land boom. Both invested heavily, buying large tracts of land around the county, which they hoped would appreciate quickly. Both were charismatic and stylish (Bertha also touted curves that would make Kim Kardashian jealous). Both platted land and laid out roads and both left lasting legacies, which are still around today. 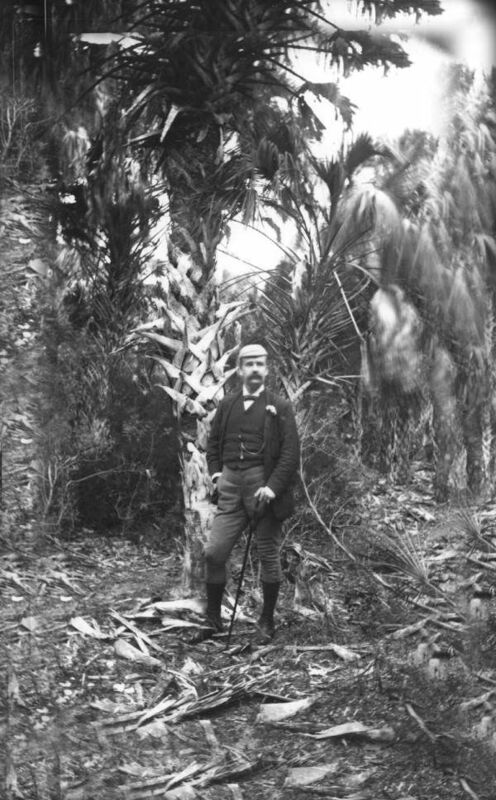 Palmer was just as wealthy and connected as Ringling. She was the widow of Potter Palmer, a land developer who famously established Chicago’s Lake Shore Drive. Now an expressway running parallel to Lake Michigan, the spans was originally intended for leisurely carriage rides. Palmer is credited with coercing city officials to build Lake Shore Drive because he thought it would add value to his adjacent property; his home overlooking the lake was known as “The Castle.” Palmer also designed and built the famous Palmer House Hotel, a swanky inn located in the Chicago Loop area. But Bertha was a legend in her own right. Coined the “Queen of Chicago,” she was known for her social connections, charity work and political stance supporting women’s rights. 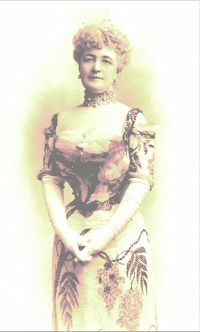 She chaired the Board of Lady Managers for the 1893 Chicago World’s Fair and she always seemed to appear in the newspapers, mostly for her designer clothes and lavish jewelry. Automobiles were a new invention at the time of Bertha’s arrival and the thick Florida underbrush was hard to clear so most folks sailed when they wanted to get from one place to another. Palmer bought Spanish Point from the Webb’s, and also purchased thousands of acres that started in Oneco and ran all the way to Venice. While Ringling was busy building a bridge connecting Siesta Key to the mainland, Bertha was enticing the Seaboard Air Line Rail Way to provide commercial transportation to the area. She is also largely responsible for dredging a channel in between Sarasota and its barrier islands. The project eventually led to the federally funded Intracoastal Waterway. Bertha introduced more nutritious grasses to area pastures for cattle grazing and began fencing the open range. At the time, a fruit fly epidemic was killing cattle in Manatee, so Bertha petitioned the city for mandatory cattle dipping. While some might criticize her for helping to bring Florida’s open range and cattle driving to an end, it is her high-tech ranch that now makes up Myakka State Park. That’s right; Bertha donated her 30,000-acre ranch, originally called Meadowsweet Pastures, now a state persevere. Ironically the property is attached to part of a 67,000-acre tract owned by John and Charles Ringling that was once the site of an oil-drilling venture. That property is now the county-owned Carlton Preserve. The southern portion of Bertha’s estate eventually became the City of Venice. Her two sons, along with the Brotherhood of Locomotive Engineers, essentially drained 8,000 acres of wetlands to create Palmer Farms and Palmer Farm Growers Association, a co-op celery packing and shipping organization. But Bertha’s heart and soul was the winter estate she purchased from the Webb’s called Spanish Point. She renamed the landmark Osprey Point, and planted exotic gardens, most notably the sunken garden that is still around today. She told people that the bay reminded her of one she’d encountered on a trip to Italy. She restored the cottages once inhabited by the Webb’s, and used them as guest quarters for her guests. Today, Bertha Palmer is rarely mentioned by locals, but the next time you drive by a landmark bearing her name, hopefully you will picture the buxom socialite who made just as much of an impact on the area as her male counterpart … what was his name again? The 52-year –old Chicago native did just that when she picked up a registration packet from the Bradenton Beach city clerk’s office May 30. Martin said she plans to run for the Ward 4 commission seat, against incumbent Jan Vosburgh. However, Martin is no ordinary candidate; she and her longtime partner, Bill Shearon run Linger Longer rentals, 302 Gulf Drive. Did I mention Shearon also happens be the mayor of Bradenton Beach? Because the mayor serves as part of the commission, it is illegal under Florida Statute for him to discuss city topics with other members of the commission in any setting other than a public forum. Scott Farrington, assistant supervisor of elections for Manatee County, said there is nothing in the election laws that would prevent Martin from running for the commission seat. Martin said residents should not be concerned that the mayor would play favorites if she wins the commission seat. However, Martin may have another conflict of interest. She and former planning and zoning board member Jo Ann Meilner are plaintiffs in a lawsuit filed in 2012, which challenges the city’s approval of an agreement with ELRA Inc., allowing construction of a parking lot on a vacant parcel south of the BeachHouse Restaurant. The lawsuit originally listed Shearon who was also a P&Z board member at the time, but he withdrew after winning the November municipal election. Martin said if she wins, she also would withdraw from the lawsuit and recuse herself from any related agenda items. Martin said she hopes her decision to run will prompt others to register. “This city needs a healthy election,” she said. “Someone needs to run against the incumbent commissioners, they shouldn’t just win by default. The Ward 2 commission seat is also up for grabs on November 4. Incumbent Ed Straight has registered to run, but so far has had no challengers. Both Straight and Vosburgh ran unopposed in 2012. Martin accused the current commission of trying to micromanage the city. She said given the opportunity, she would trust city employees to do their job. She would also like to see the city budget back in the black. A recent audit determined the city was spending more than it had taken in. Martin has called Bradenton Beach home for the last 11 years. She was one of eight children raised by factory workers in North Chicago. She said she realized she was good a building things early on. Her mechanical talents earned her a job manufacturing machinery in a local factory, a career she says she greatly enjoyed. However, it was cut short when she suffered a work-related injury. Martin was a server at a German restaurant when she met Shearon. “He was a regular and basically swept me off my feet,” she said. The couple was “snowbird cruisers,” living on a boat in Illinois over the summer and sailing to Longboat Key during the winters. Eventually, they took root in Bradenton Beach and have lived there ever since. Martin currently serves on the Scenic Waves Committee. Residents have until June 20 to register to run for office. Candidate packets are available at the city clerk’s office at city hall, 107 Gulf Drive N., or at the Manatee County Supervisor of Elections Office, 600 301 Blvd. W., Bradenton. Applicants are required to have established residency within the city for 90 days and be registered to vote in the ward for which they qualify. The candidate must pay a qualifying fee equal to 1 percent of the annual salary for the office sought — $96 for mayor, $48 for commission seat — and obtain 10 petition signatures of voters residing in the city. A Holmes Beach woman died after she shot herself in the chest June 6 while cleaning a revolver. Janice Louise Kartzert, 65, was found dead insider her home in the 300 block of 60th Street around 12:45 p.m., according to the report from the Holmes Beach Police Department. Kartzert’s neighbor called 911 after he reportedly looked in her window and noticed her body slumped over in a chair and blood on her chest, the report said. The neighbor said he became curious when Kartzert did not come to the door as she normally does every morning. According to the neighbor, Kartzert gives his dog a treat if he comes to her back door on their morning walks. A team of emergency medical responders arrived at Katzert’s home at 12:28, she was pronounced dead at the scene. An HBPD officer noticed a silver revolver on the table next to a cleaning kit and towel, the report said. Holms Beach Police Chief Bill Tokajer said officers initially thought Kartzert died as the result of a suicide, however, after they analyzed the crime scene, they determined Kartzert had been cleaning her gun when it accidentally fired. Locals knew Kartzert as “Scooter Jan,” because of her distinct yellow motor scooter she used to navigate the island. On Sunday mornings, Kartzert’s scooter was usually parked outside D’Coy Ducks, 5410 Marina Drive, Holmes Beach, where she often played cribbage. Gula said Kartzert loved to splurge on her friends on their birthdays. “She was a wonderful person and she will be missed,” Gula added. 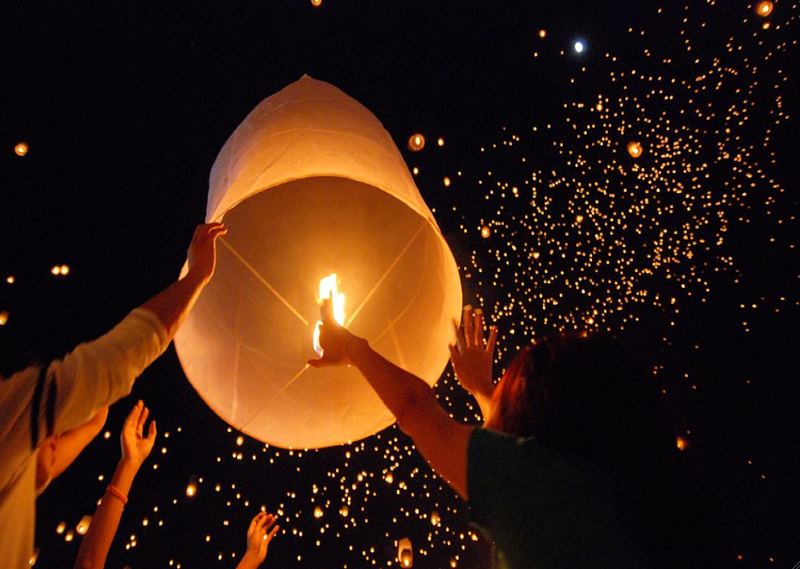 Sky Lanterns: Beautiful or Dangerous? Imagine standing in the sand with small waves breaking at your ankles and looking up to see hundreds of flying luminaries drift slowly through the night sky. Mathews, who often coordinates weddings on Anna Maria Island, said the ceremonial release of aerial luminaries has gained popularity in recent years, especially during weddings and remembrance events. Also known as Chinese lanterns, sky candles and fire balloons, aerial luminaries are essentially miniature hot-air balloons, made of lightweight rice paper and bamboo frames that are kept aloft by a burning candle and are made to disintegrate in the air. Normally released over the water, the destiny of the flying lantern is greatly dependent on the weather. Just ask Suzi Fox, executive director of Anna Maria Island Turtle Watch and Shorebird Monitoring. Fox recently collected the charred remains of a half dozen aerial lanterns from her Bradenton Beach neighborhood the morning after they were released at a beach wedding ceremony. Fox has started a grassroots movement to get the luminaries banned throughout the county. 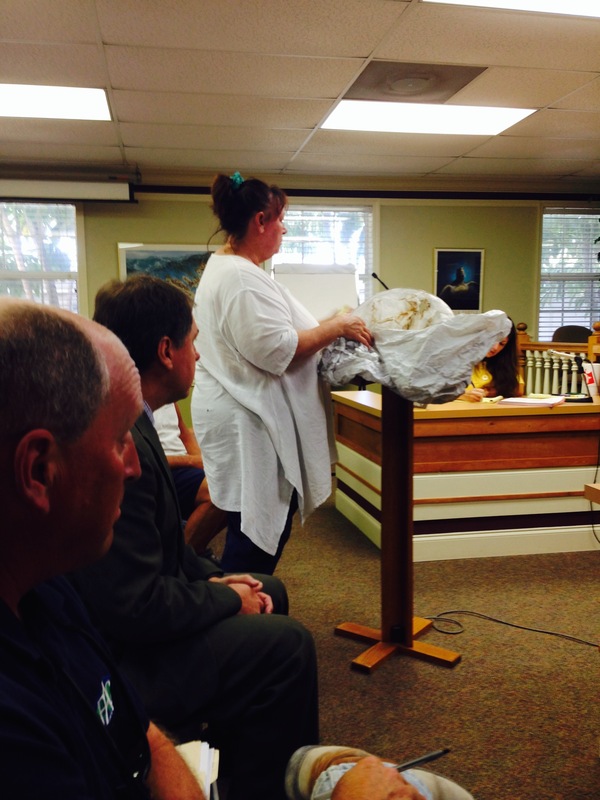 “I would like to see the whole island on board with this, but I’m starting out with the city I live in because this one was in my backyard,” Fox said as she held up what was left of an aerial lantern. WMFR Deputy Fire Marshall Jim Davis said he initially didn’t see the need for a special ban on the luminaries because ordinances already in place specifically prohibit the use of fire on the beach. The luminaires are addressed on a state level through fire codes, according to the National Association of Fire Marshalls, but Davis feels not having them specifically mentioned in the code has caused issues with enforcement. Davis has been avidly against allowing the release of the lanterns after at least two brush fires were attributed to lanterns on the beach four years ago. Davis said the occurrence prompted him to speak with several island businesses associated with events to discuss the lanterns. “I thought we had an understanding that the lanterns were not allowed, but people continue to release them,” he said. Davis plans to bring the topic up at the June 10 fire marshal meeting, where officials from all the fire organizations within the county get together. The USS Narcissus participated in the Union victory at the Battle of Mobile Bay. However, that same year a torpedo struck the hull on the starboard side and the ship sank in 15 minutes. Remnants of Florida’s maritime history lie scattered along Florida’s coast, some of them untouched for thousands of years. Dugout canoes used by Native Americans to trade with other tribes await excavation. The skeletons of Spanish Galleons that arrived on Florida shores in search of gold and everlasting existence sit undisturbed on the ocean floor. And countless vessels commissioned to conduct military operations during a variety of conflicts convey a story of bravery, endurance and patriotism. But those artifacts can’t be brought into a classroom. A new trend in preservation has focused on shipwrecks to encourage the education of Florida culture and allow learners the opportunity to participate in a bit of adventure. Shipwreck parks are relatively new to Florida tourism, meant to serve as educational preservation through recreation. The program began in 1987 with the designation of the Urca de Lima, a Spanish merchant ship, which sank off the coast of Ft. Pierce in 1715. Now officials have nominated the USS Narcissus, the remains of a U.S. Navy steam tug sunken off the coast of Egmont Key, as Florida’s twelfth shipwreck park. The wooden-hulled screw tug had a shallow draft of six feet, could reach speeds up to 12 knots and was armed with a 20-pounder Parrot rifle that fired a 12-pound cannon. The U.S.S. Narcissus served during the Civil War, but blew up and sank in 1866 during a storm, taking the entire crew with it. Today parts of the steam machinery, propeller and a portion of the wooden hull are positioned on a sandy bottom northwest of Egmont Key in about 15 feet of water. The conditions are perfect for diving, as the current is often mild and visibility impressive. The wreck would be the second in the area. In 2004 the Regina, a molasses barge, wrecked during a storm off Bradenton Beach, becoming the states tenth underwater preserve. If the USS Narcissus site becomes a preserve, an opening ceremony will be held to dedicate the new Preserve and to place an underwater bronze plaque designating the site a State Underwater Archeological Preserve and Florida Heritage Site. Designating an underwater wreck as one of Florida’s Underwater Archaeological Preserves takes months of preparation. The designation requires historical research by archeologists, historians and divers as well as underwater mapping of the site. The Florida Aquarium and South Eastern Archaeological Services nominated the wreck in 2010. The USS Narcisssus was built Albany, N.Y. in 1863, the commissioned by the U.S. Navy for use in Mississippi Sound, New Orleans, Mobile Bay and Pensacola. Admiral David Farragut of the West Gulf Blockading squadron captained the ship. In August 1864, the vessel participated in the Union victory at the Battle of Mobile Bay. However, that same year a torpedo struck the hull on the starboard side and the ship sank in 15 minutes. Although no lives were lost during the attack, the blow marked the end of the tug’s war career. The USS Narcissus was salvaged, but spent the remainder of the war at the Pensacola Naval Yard under repair. 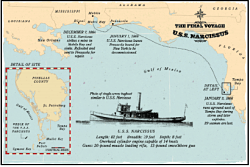 At the conclusion of the Civil War, the USS Narrcissus departed Pensacola destined for the Northeastern U.S., where she was to be sold. However, the tug ran aground and sank Jan. 4, 1866 while navigating around a storm off the coast of Tampa. The collision caused the broiler to explode, blowing the ship, and the entire crew into the depths of the Gulf. The park is expected to draw in diving and snorkeling enthusiasts and Florida heritage tourism as well as generate revenue to surrounding communities. Florida’s shipwreck parks are well visited often introducing charters to the site several times a week, especially at the height of dive season. • Urca De Lima, Spanish merchant vessel, Ft. Pierce, Fla.
• USS Massachusetts, U.S. Navy Battleship, Pensacola, Fla.
• SS Copenhagen, single screw steamer, Pompano Beach, Fla.
• SS Tarpon, merchant steamer, Panama City, Fla.
• Half Moon, German steel racing yacht, Key Biscayne, Fla.
• Lofthus, English barque, Boynton Beach, Fla.
• Vamar, tramp steamer, Port St. Joe, Fla.
• Regina, screw steamer turned tanker, Bradenton Beach, Fla.
• George Valentine, Barkentine, Stuart, Fla. So the next time you are feeling adventurous, trade the hiking boats for flippers and come on out to a shipwreck park located in your area.